One of the most popular action role-playing hack and slash games - Diablo 3 - has got the next video. 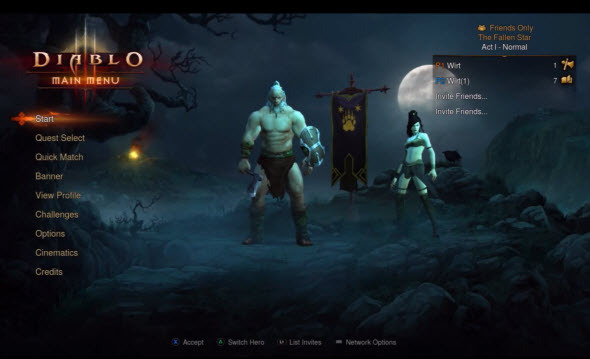 New Diablo 3 trailer shows the cooperative mode of the project that now is being developed for PS3 and Xbox 360. Diablo 3 trailer was published yesterday for E3 expo. In the video four players are travelling across the beautiful game's locations and fighting against hundreds of enemies. Cooperative mode shown in Diablo 3 trailer will be available in the console version of the game at the end of the year. And we'd like to remind you that Diablo 3 for Xbox 360 and PS3 is scheduled for the third of September, 2013. Together with Diablo 3 trailer yesterday the developers announced another not so good information. The release date of the Diablo 3 expansion pack is delayed. Whether this DLC will come to the shops next year still remains unknown, as well as the release date of Diablo 3 for PS4.